My local quilt shop rearranged their shop and put the sewing machines at the front of the store instead of the back. 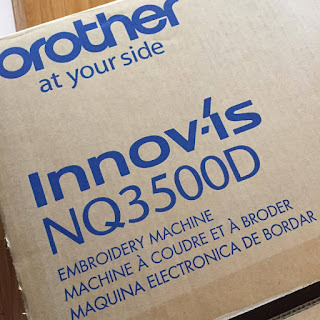 And when I went in for something small, my sweet husband saw some great deals on embroidery machines and needless to say, we went home with a large box! I have lots of ideas that I want to try out with it as soon as I learn how to digitize my own designs, but in the meantime, I bought a bunch of designs from Designs by Juju and stitched them into some cute little mug rugs. These were good sellers for me this year and I am loving my new machine!